Boston bartender Jackson Cannon chimes in on the Painkiller debate via Eastern Standard's cocktail menu. While I was on a gin tour in London last week (recap coming soon), I missed the dramatic unfolding of a legal tussle between Pusser’s Rum and Painkiller tiki bar. 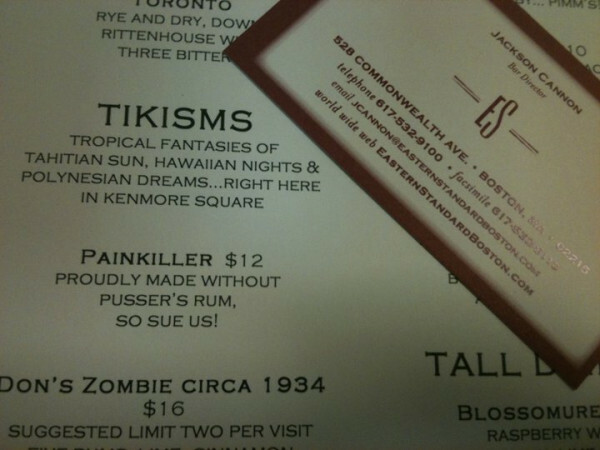 By now, you’ve probably heard that Painkiller decided to change its name to PKNY and give up its web domain after Pusser’s filed a federal lawsuit over its ownership of a trademark for the drink named “Painkiller.” Furthermore, the rum company says all drinks called Painkillers must be made with Pusser’s. (Painkiller/PKNY was not using Pusser’s in its Painkillers.) News of the litigation led to an uproar among the cocktail community, which found such aggression by a brand over a small bar to be distasteful and a bad PR move. To make matters worse, Pusser’s founder Charles Tobias responded to the criticism with a statement mentioning the brand’s intent to market ready-to-drink Painkillers “in a can.” For more insight into the legality of all this, read Payman Bahmani’s post on Umamimart. At any rate, be sure to continue enjoying your favorite cocktails and favorite bars, whether they are trademarked or not. Last night kicked off the inaugural NYC Cocktail Week, sponsored by Liquor.com. Sixteen cocktail bars in the city (see the full list here) have created a special Cocktail Week menu offering two drinks plus an appetizer for $20.11. If that doesn’t make you feel better about your lushy habits, a portion of proceeds from the event, running through June 29, benefits City Harvest and the Museum of the American Cocktail. Last Sunday, members of LUPEC (Ladies United for the Preservation of Endangered Cocktails) gathered at Astor Center for a competition and breast cancer fundraiser titled “Speed Rack.” Sixteen female bartenders vied to make cocktails as fast as possible (different drinks were announced each round, including the Ramos Gin Fizz), and they were also judged on the quality of their drinks. Yael Vengroff of PKNY took first place and will compete against other finalists from around the country at Tales of the Cocktail 2012. Wondering why you haven’t seen as many Dizzy posts lately? I recently started writing a daily drinking column over at CBSNewYork.com. Don’t worry, I’ll still keep things fresh for you here, I’m just getting adjusted to the new schedule!